When Jamie Chua bought her first “Birkin”, she didn’t have much of a choice. In fact she didn’t have any choice as the only handbag in this distinctive style in the Hermès boutique was a 40cm Rouge Vif. She no longer has the bag, finding it too heavy to carry comfortably, but she has added many others to her enviable 200-strong collection of designer handbags, primarily from Hermès and Chanel. Her most prized handbag is a 30cm Himalayan Diamond Birkin, though she confesses not her favorite to use: “I feel a little silly toting a diamond bag around. It’s like screaming, ‘I don't know where else to pave my diamonds!’ So I use it for display," she explains. While the Birkin takes its name from actress and singer Jane Birkin, the Himalaya version refers to the snow-capped peaks of the mountain range it is said to resemble with its gradation of pearly white to smoky grey. The bag is so rare it’s often described as “the Holy Grail” in a handbag collection. The resale value of Himalaya bags can be strong, typically in excess of $100,000, which is around 40 percent more than their original store price. In May, a diamond hardware version of a 30cm Himalaya crocodile Birkin bag sold for $376,500 at a Christie’s auction in Hong Kong, setting a new record for a handbag auction. 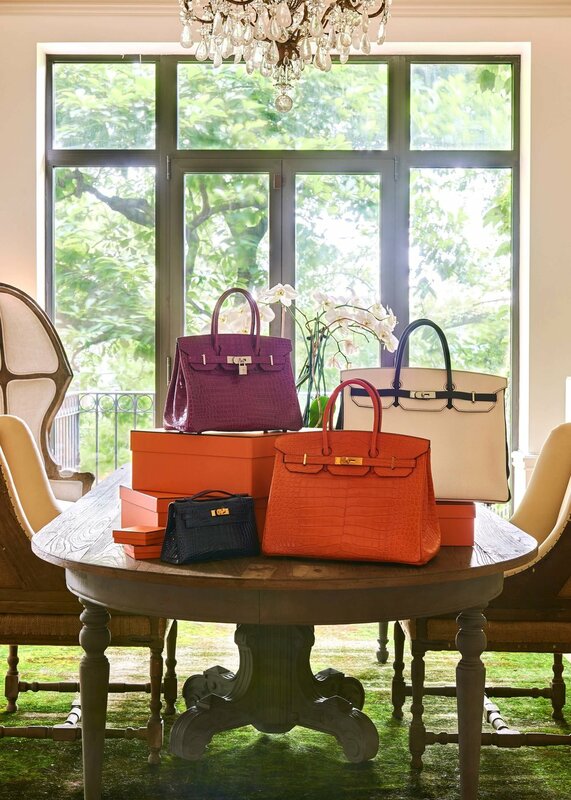 According to research by baghunter.com, an online platform for buying and selling luxury handbags, Hermès Birkins make up 90 percent of the secondary market for collectible handbags, and they have outperformed traditional investment options in the last 35 years, averaging annual returns of 14.2% in comparison to the S&P 500’s 11.66% nominal growth (8.65% real) and gold’s returns of just under two percent (1.9%). Another tip to hold or add value, according to Berk, is to bring your used bag to the “Hermès Spa” and get it refurbished as much as possible. “They might replace the hardware for you. With this improved bag, you also get the receipt for the Spa process which helps validate its authenticity,” he explains. The Birkin 'So Black' is another highly collectable handbag, because it was only produced in limited quantities in 2009 and while it originally sold at around €9,000, it can now easily reached €25,000, according to Lalande. But beyond the headline-grabbing Birkin, Lalande points out it is the Hermès Constance bag that has shown the highest value increase over the last 10 years, as its price has multiplied ten-fold. The bag was first created in 1959, and named after the daughter of the then in-house designer. “Because Hermès stopped the production of the bag for several years it became hard to find. And while the production of the bag restarted four years ago, it still appreciating,” Lalande says. Chanel and Louis Vuitton are also popular with handbags collectors, particularly for older bags. “These brands are more collectible when you go back about ten years and start looking for limited-edition or runway pieces. At that age, it's tough to find specific pieces in great condition, which makes those bags more collectible,” D’Amato explains. “Chanel has an extremely wide clientele base from the 15-year-old to the 60-year-old, particularly for the "Timeless"* Classic Flap Bag and the 2.55 bags. Some limited edition (versions of these) in tweed are extremely hard to find and can fetch high prices,” Lalande says. While he points out that not all of Louis Vuitton’s limited editions are highly collectable —as the brand is increasingly releasing all its new bags in limited editions —he singles out the Steven Sprouse Graffiti, which was the first artist collaboration the French maison ever did, as the most sought-after of all its artistic collaborations. Amongst other collectable handbags, D’Amato says Judith Leiber’s minaudieres, which are sought after for their sculptural designs, can fetch around $1,200 at auction, though that market has “eroded” in recent years, because devotees cannot fit their phone into the small bag. In the age of Instagram, that’s just a no-no.